An Albany Transit System bus heads south on Washington Street on the afternoon of Oct. 27. A plan worked out by consultants calls for changes in the Albany bus system to make the service more reliably punctual. It also proposes an expansion of the system years from now. Now, the buses run every 60 minutes from 6:30 a.m. to 6:15 p.m. at an annual cost of about $628,000. The consultants recommend that service be extended 15 minutes in the evening, but that the frequency be cut to 90 minutes to try to make the buses run on time. Later on in the 20-year planning period, the plan suggests going back to hourly service and adding a third bus, bringing costs to about $1.1 million a year. Still later, in what the plan calls the “long term,” it calls for eight buses to run every 30 to 60 minutes between 6 in the morning and 8 at night. This would cost about $3.2 million a year. It now costs a dollar to ride an Albany Transit System bus. The consultants recommend against raising the fare because most riders can’t afford it. Will the annual cost really double in 20 years for an electric bus with no driver? DaleS makes a good point. It’s very likely that projecting 20 years into the future for transportation is risky at best but that’s what consultants get paid big bucks to do. Big changes will likely take place in two decades, driverless transport being foremost. Although transit systems are unlikely to ever recover their costs from riders, any decent city should have a transit system that enables people who don’t/can’t drive to get around. And the rest of the cost becomes a tax on those who wish to retain their independence from scheduled social overhead capital. A useful transit system is one sign that City Leaders are in tune with the times. Take Corvallis. Here is a community roughly identical to Albany in population terms. 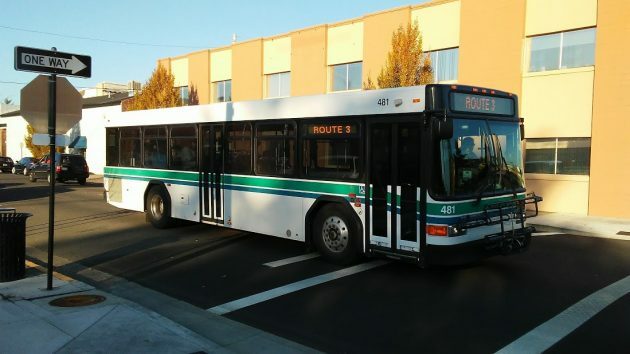 The Corvallis Transit system runs between 7AM and 7:30 PM 6-days a week. The cost to passengers if FREE! The citizens of Corvallis voted to pay a separate per-household tax to directly fund their mass transit system because the citizens of Corvallis value their environment and the streets of their community. While no one particularly wished to pay an additional tax, the Corvallis Mayor and City Council understood that if they demonstrated leadership on this issue, the citizenry would see the value and vote for the tax, which is what occurred. Now, imagine the Albany leadership. They decided to spend monies on yet another Consulting firm to do research that was done previously, research concluding what was already well, understood. Namely an underfunded fixed route system running too few hours, charging far too much and not running at all on weekends. Yet the City is more than happy to accept US Dept. of Transportation grants to purchase new buses and other vehicles. It seems clear. The term “Visionary” cannot be applied to the Albany Council. Given that our city leaders want to spend time and effort on issues such as moving an old church building a couple of blocks, on rebuilding a duck to float in the pond, and on building a carousel without considering the parking issues, it seems to me that the Council and the Council’s personal bank, CARA, could make this bus system actually serve the community. Citizens who need to get to work, or to school everyday using mass transit must be at least as important as carousels and fiberglass ducks. You have to remember their voter base includes thousands of students that want a free ride. Most will be gone in 1-4 years. The tax n question is levied only on property owners, not on university students who rent. Unless you were a property-owning student at the time of the ballot measure that passed electoral muster, you do not pay the tax…at least directly. No doubt landlords have built this tax into rents. Students don’t think like that. They don’t realize landlords just raise the rent to cover additional expenses. To them, it’s a free ride. My experience as a renter in Corvallis since 2000 is that rent is whatever the market will bear (or maybe that’s just my economic prejudices clouding my thinking). A small increase in expenses will raise the minimum price needed for any business to make a profit, but supply, demand, and competition will have a much larger affect on the price. It is Corvallis’s less enlightened policies, like its endlessly drawn-out development-approval processes and appeals, its voter-approval for even the tiniest city annexation, and its NIMBYism that are mostly responsible for our high housing costs. The buses would tend to be a bit more on time if the drivers didn’t need to chat with each other for another 5 minutes after they should have left the station. Most the drivers are pretty good about trying to keep on schedule, but there’s one that always seems to take at least 65-67 minutes after he starts. If they want to go to a 90 minute route, have both buses running the same route (similar to route 1 or 4 with a 45 minute offset. Highest adult fare is $1 for individual rides. Others bring in less money (older, younger, coupon books). I don’t know the arrangement with LBCC, OSU, and the “Ride home free” merchants; let’s assume their contribution is $1 or less per ride on average. This means there is less (probably much less) than $80,000 coming in from sources other than government subsidy. Also, subtract the cost of handling wads of mini-money every day. Conclusion: 90% or more of the cost is paid by taxpayers. This scheme doesn’t make sense economically. The fixed cost to run the system dwarfs the per-ride cost. Having more riders (likely if fareless) is better than having fewer riders for many reasons, especially to help solve parking and congestion problems and help keep marginal drivers off the road, problems which cost everyone money and time. Of course, with a minimal system like Albany’s, the impact will be low, but that’s a different argument. At 80,000 rides per year, it’s about 13 rides per hour on each route. Corvallis (my home) has this one right. When it was proposed, I thought it was crazy until I saw the numbers and the same 90+% figure. Do the 80,000 rides per year include the LOOP bus? It seems to be predominately used to shuttle LBCC students to Corvallis and is often packed overfull.. Does Albany “foot the bill” for those people? No, the Loop counts about 100,000 passengers a year on its own. As a regular rider of the city bus I would say that moving it to a once per 90 minutes would not be very helpful. I often have to leave my house 1-2 hours ahead of the time I need to be somewhere like work or medical appointments. If I have to transfer routes it takes longer. And if I want or need to go shopping on the weekend – I’m out of luck. I do recommend that the city look at options of improving the transit here.